Insite provides metering and billing services compatible with a range of heat network system products, from the award-winning Guru Hub to third-party, open-protocol meters. In the simplest terms, metering and billing services for heat networks are provided by one of two types of system; a Credit Billing system or a Pay-As-You-Go (PAYG) system. The type of system used is often specified in the employers requirements against which the building is designed and built. Some developments may have different types of systems operating throughout the same site, possibly serving different tenure types. At Insite, we work with which ever system(s) our clients instruct, so long as the system is “open protocol”, so we can access the data within it to provide our services. We do however recommend certain systems over others, because we have direct experience in commissioning and operating several of those available in the market, so have a good practical awareness of those which work and those which don’t. If you would like to discuss your specific requirements for any project, how you can achieve best practice in Metering and Billing for heat suppliers, or how you can ensure compliance with the 2014 Heat Network Metering and Billing Regulations, please contact us. Heat Networks may vary in design and operation. The basic principles and connections required for successful metering, billing and monitoring services are shown in the diagrams below. Wired MBUS network connecting property. Heat meters to plantroom data recorder. Any credit billing system relies on regular and accurate heat meter readings from all the properties connected to the heat network. Readings must be remotely collected from the properties, and transmitted or collected from the site by Insite using web based technology. A system like this is generally referred to as a remote Automated Meter Reading (AMR) system. Heat Meter (mains or battery powered) within the property with a wired MBUS output. A site-wide cabled network, called an MBUS network, which connects all the heat meters back to a single location such as the plant room. NB: There are various cable types used for MBUS networks, Insite recommends the Belden 8444 multi-core cable. A site datalogger at the point the MBUS network converges to record the readings from the heat meters on a daily or more regular basis. There are many makes and models of datalogger available on the market. Insite recommends the open protocol IZAR Centre M range for this purpose. A high grade router and connectivity to a fixed IP (static) broadband connection. This provides the remote connectivity to site in order to collect or transmit heat meter reading data used in the billing process. NB: Where wired MBUS data networks do not exist (retro-fit) or cannot be accommodated within the design of a site, radio based alternatives provide another option for MBUS data collection from within the properties. Typically these are alternative solutions and are only used in the event a wired solution is not feasible. Low cost maintenance and replacement of equipment. Simple to operate / manage. Provides no protection to the heat supplier (or buy to let owners) from debt risk of residents that decide not to pay their heat bill. No or limited resident interface / energy display. Sites often suffer hidden commissioning defects that can be difficult to rectify post completion. Requires careful management of change of tenancy data (which clients often find hard to guarantee) to ensure accurate billing and maximise heat charge recovery. The following list of site M&E considerations is based on a typical installation of a Guru system with an optional hard-wired MBUS network running in parallel. It covers the main considerations that any installing M&E contractor would need to have allowed for within their scope of works in order to successfully install a Guru system. This list is a guide only, and whether a new build or retro-fit project, there are typically options and solutions that may deviate somewhat from this prescribed list. Adaptability and flexibility where possible are key to success. Installation of Guru Base unit in HIU cupboard of each property. Inclusion of Mains Powered Heat Meter with Dual Wired MBUS outputs – Meter make / model to be on Guru Systems Ltd ‘approved’ list. Inclusion & installation of Prepayment control valve for use by Guru system. Recommended is Cimbario 602RE available from SAV Systems and available factory fitted within HIU. NB: Other HIUs such as Altecnic & Elco solutions also have factory fit compatible value options. Installation and testing of site wide wired MBUS network utilising Belden 8444 cable throughout site, converging on single data collection point (subject to site survey and distance limitations of MBUS). Connection within properties of Heat Meter MBUS output, Mains Power & Valve fly lead to Guru Base Unit in accordance with Guru installation guide. Provision of AC240v switched sockets within electrical risers for dedicated use by Guru Radio Repeaters (locations to be specified in RF survey). Ordering and installation of ADSL Fixed IP broadband for use by Guru system in location(s) identified by Insite RF Survey. Provision of 4x switched sockets to same location(s). Installation of secure cabinets in risers and plant room to house Guru infrastructure equipment in locations identified in RF survey. Provides total control of debt risk for the heat supplier. 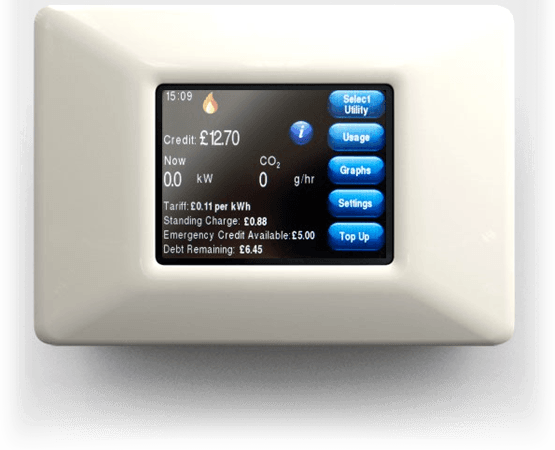 Provides residents with friendly energy display device in their home which is ENE3 Code4 sustainable homes compliant . Provides flexibility to switch from credit operation to PAYG remotely without the need for costly site visits. Speeds up diagnosis of heating faults and reduces unnecessary call out charges & delays. Simple for residents to operate / manage & pay for their heat use. The Guru Hub is a smart energy meter, customer display device, and payments solution, all in one unit. It’s our most popular metering and billing solution. It can be configured for credit billing or pay-as-you-go payment options, giving flexibility to landlords, housing associations and residents’ associations. Meter readings are taken remotely and sent automatically to Insite. Starting a housing development project? Get in touch to see how Insite can help.